Custom Digital ID Cards – Easy! You don’t need to be a designer to design digital ID cards for your institution. Our Card Template Builder makes it easier than you could ever imagine! By selecting different background and font colors, setting custom card fields, adding your logo to the card, and choosing a preferred barcode type, you can set a standard ID card design for the entire institution in just a few minutes. As you make changes, you will be able to see how your card is going to look with these settings, so you can quickly adjust the chosen parameters. You can even upload a placeholder ID photo to have an even better idea of what the final card is going to look like. Yes, it’s that simple! Many institutions want to make their cards look unique, with colors that are representative of the institution. Our Card Template Builder allows administrators to choose colors that are more applicable to their institution to make their cards look more personalized. Adding a logo to all cards is yet another great way to customize digital ID cards. Choosing what information institutions want to show on their digital ID cards is another crucial part of card customization. Our Card Template Builder allows administrators to add their own custom fields to the card. They can also choose to keep or slightly edit the default card information fields. Another important part of card design is selecting the type of barcode displayed on the card. We have a number of barcodes to choose from: QR Code, Code 39, Aztec, PDF417, or Code128. The choice typically depends on the type of a barcode scanner that the institution is planning to use for scanning the cards. 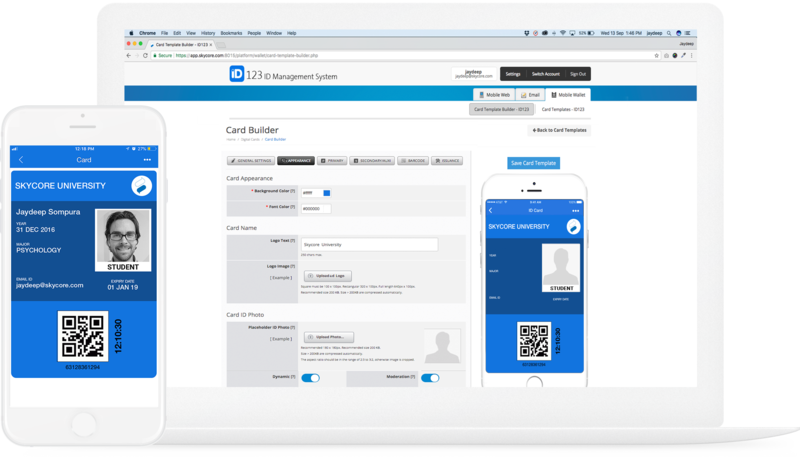 Log in to your account on IDMS to design your card template or read more about our IDMS.